and purchased this Cobra/snake pendant. so I decided to celebrate this kick-off by making a piece for her. Something summery, but also something that she would like. This was very challenging as I don’t know her at all IRL. And 925 Sterling Silver for style & durability. Her enthusiastic reply on my order-confirmation had a light & ‘sparkly’ tone, which would be ‘summery’ in my translation. it has the colour of the infinite Sky & Ocean. White Pearl for elegance & purity and Black Pearl adds mystery to it. 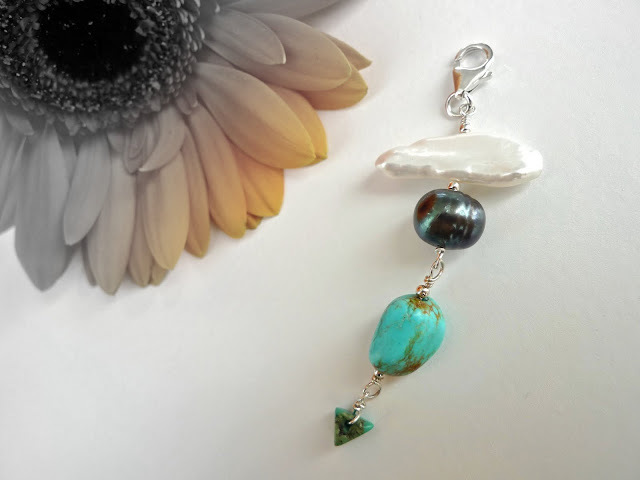 A little green Turquoise chip to finish the charm. All these free shaped semiprecious stones give the charm some attitude. Thanks M'inda and have a great summer!